This morning’s visit to the shores of Lake Erie was lovely as always. Today’s cross-hatched ripples and low, quiet waves were highlighted by the powder-blue sky and warm sun. I shot a good number of images of the placid lake, morning haze, and water lapping against rock. Then I saw two large silhouettes approaching, low over the water from the west: a couple of Great Blue Herons! I see the big birds along the Erie shoreline on occasion but the waders generally prefer the still, shallow waters of ponds and quiet streams. The lead bird flew past, to my north, and alighted on a stone breakwall. 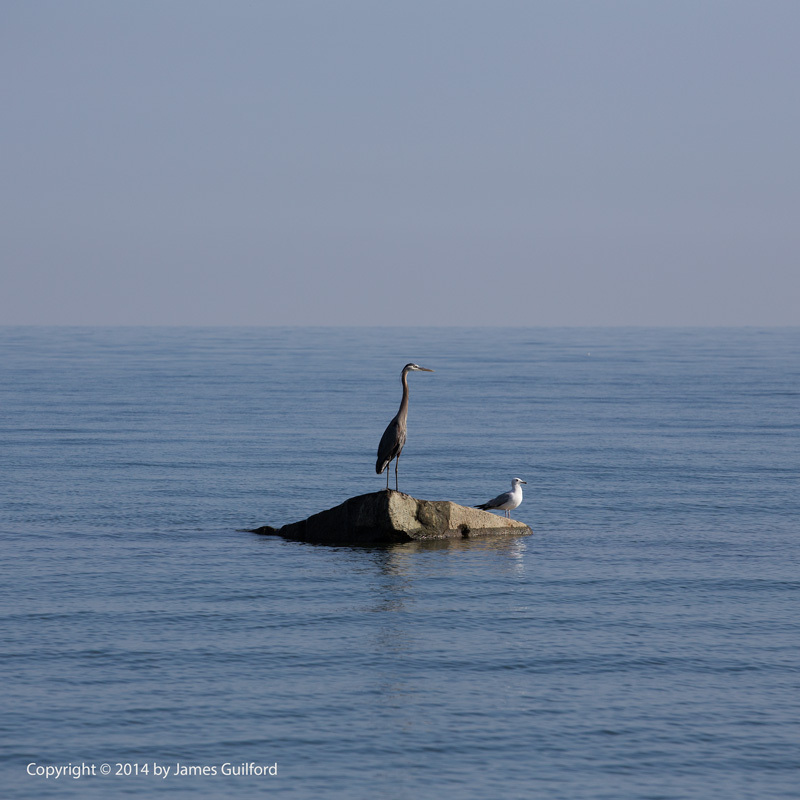 The second heron landed on a solitary stone, not far to my left and made for an interesting sight … a tall, slender bird perched atop a rock, isolated in quiet blue water with hardly a horizon to be seen behind. I’d have preferred the ring-billed gull not already been on the rock but the pair seemed to not mind each other’s company. It was almost as if the heron was looking out for the much smaller gull. I shot image after image as I slowly moved closer to the scene, being watched by the birds just as I was watching them! Then, too close! First the gull, then the heron took flight. I don’t know where the gull went but the heron flew to join the other “Great Blue” on the more distant breakwall. It pays to watch out for each other.